There were several poems and songs written about the Coo-ees during the 1915 Coo-ee March. First published was a poem written by Del. 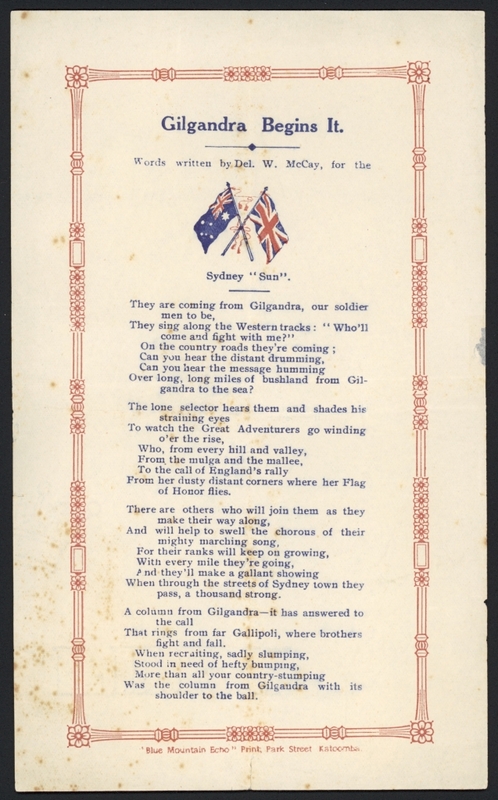 W. McCay called ‘Gilgandra Begins It’, which was published two days after the Coo-ee March commenced, in his column ‘The Moving Picture-Show’ in The Sun, on 12th October 1915. Over long, long miles of bushland from Gilgandra to the sea? they pass, a thousand strong. Stood in need of hefty bumping. 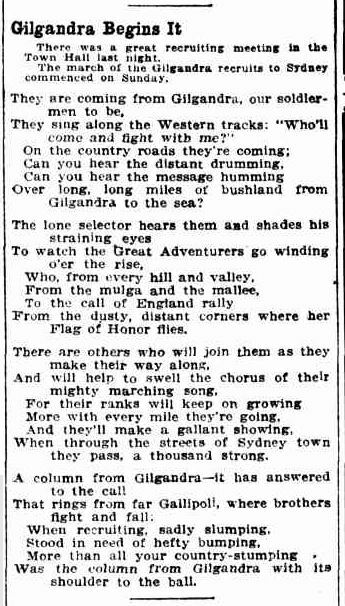 The Blue Mountain Echo reported on 12th November 1915 that this song was sung by the choristers at the concert held for the Coo-ees at Katoomba on Friday night 5th November 1915, and ‘So stirring was it, in fact, that the “Coo-ees” have adopted it as their marching song’. The National Library of Australia also holds a copy of the printed music score by E. A. Ferguson, titled Gilgandra Begins It : The Marching Song of the Coo-ees. A digitised copy of this music score can be viewed at http://nla.gov.au/nla.obj-166916648. It has an attractive cover, with a photograph of the Coo-ees on it.